Fall Travel Deals for Park Visitors | Oh, Ranger! Take the scenic route to the Grand Canyon via the Grand Canyon Railway. Now through November 18, the railway is offering a round-trip excursion, including a two-night stay at the Grand Canyon Railway Hotel with breakfast and dinner provided for each person. You’ll begin your journey 65 miles south of the Grand Canyon and enjoy fantastic views throughout the 2 hour and 15 minute journey north. Spend the afternoon exploring the canyon before relaxing on the train ride back to your hotel. Two night packages start at $220 per adult and $41 per child. If you’re heading to the west coast, visit Olympic National Park in Washington. Here you can view eight different plant species and 15 animals that you will not find anywhere else on Earth. Olympic National Park has three diverse areas; mountains, forest, and coast so there is truly something for everyone. Stay in a Lakeside, Main Lodge, Boathouse, or Fireplace room at the beautiful Lake Quinault Lodge. September 9 thru December 23 the lodge is offering special rates starting as low as $101.50 per night (plus taxes and fees). Known for its soaring cliffs, Zion National Park is the place for avid rock climbers. The cream, pink, and red sandstone walls stretching towards the bright blue sky will mesmerize all, even those who prefer to keep their feet on the ground. The Zion Lodge is offering a “Fall into Great Deals” package, where children stay free in the same room as a paying adult and additional adults pay only $10. This offer is valid from November 1-30, perfect for those looking to take an unforgettable Thanksgiving vacation. 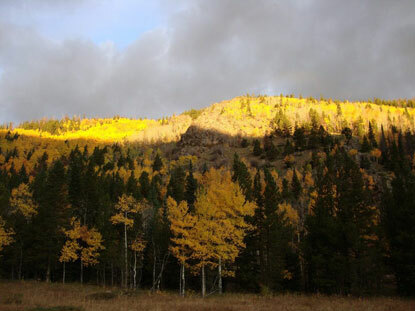 I personally will be heading up to Rocky Mountain National Park for the Aspen Gold Rush; the trees begin turning their leaves at the high elevations in late August, reaching lower elevations by October. The peak of gold rush is usually in late September, also the time when elk bugling begins (mid-September to mid-October). I’ll also be keeping an eye out for the bighorn sheep head-butting “contests” near Fall River Road during October and November! For those traveling from out-of-state, many lodges offer wonderful off-season deals, including the beautiful Castle Mountain Lodge on Fall River, and The YMCA of the Rockies. For even more autumn travel deals, visit the National Parks Promotion Council website, or check with the lodging, dining, and recreation companies located in and around the parks. Image: Rocky Mountain National Park. Source: National Park Service. Submitted by leenadasot on September 8, 2012 - 8:09pm. Hi, I love national parks, Thanks for sharing this useful imformation with us.